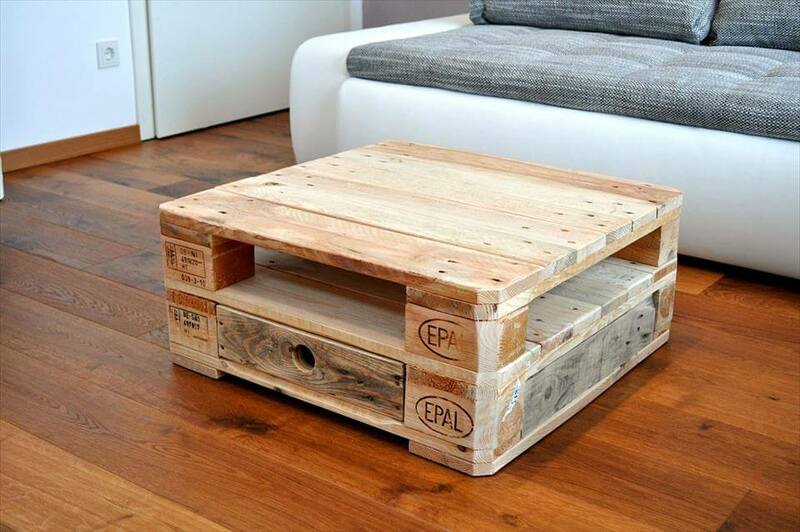 Before some time pallet wood was solely known as the shipping wood to covey the goods safely and stably at their destinations but these days they are more familiar for their furniture crafting abilities. As the pallet are thrown away after performing their shipping function so people have started using it a cheap furniture source and now it owns a world. 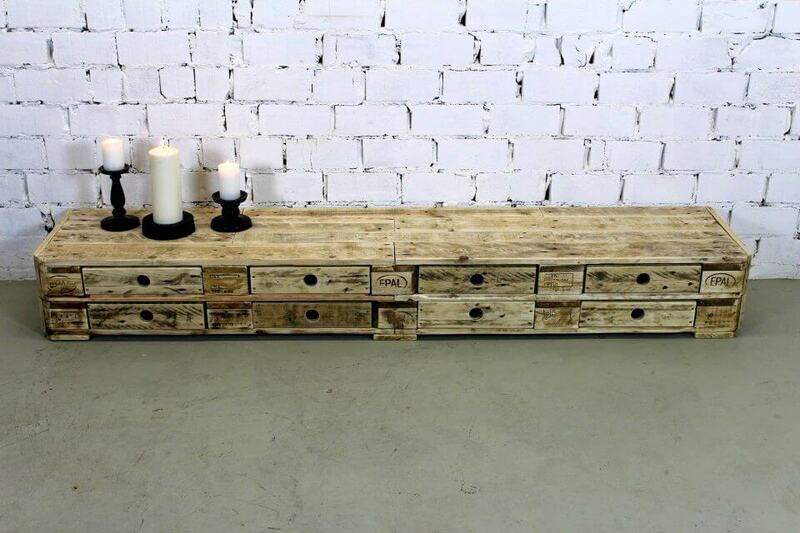 You can see how internet is brimming with the ideas and projects in an endless amount telling you incredible ways to use this recycled wood and gain your furniture possessions that you have ever dreamy of. 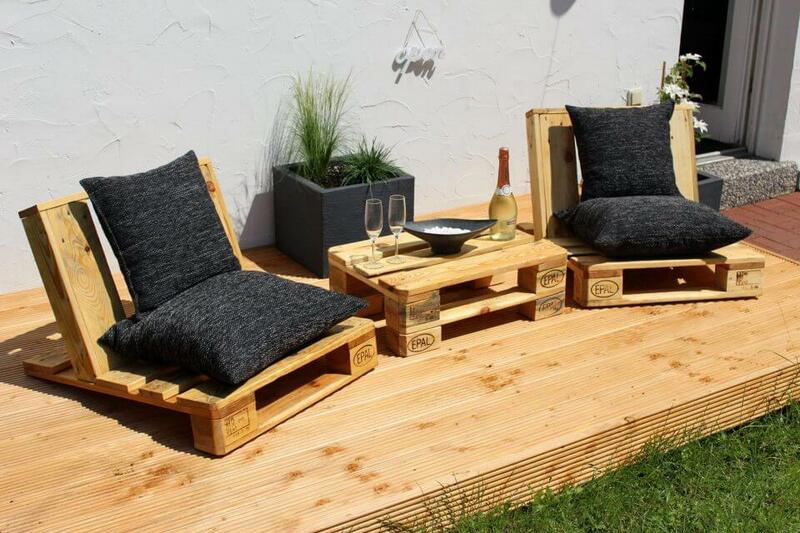 And here on our platform we are going to show some awesome pallet furniture plans for both the indoor and outdoor section of your house so that you can pick up some inspiration from them and start up your journey with the pallets. 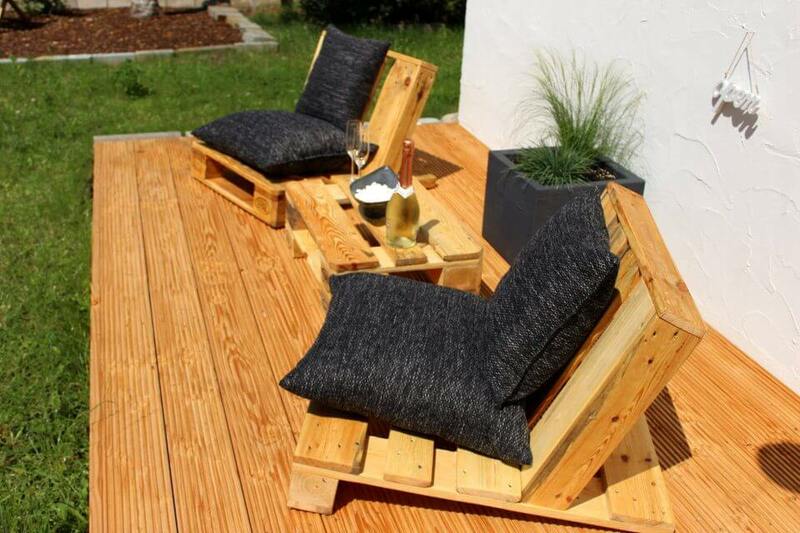 So check out these awesome DIY pallet projects for the indoor and outdoor home sections and enjoy a far better lifestyle than you have now. The very first focus of this post is on the outdoor area be it patio, yard, deck or the lovely garden area we got three super functional goals for all of them. A lovely breakfast table for fun family time, vertical planter for the decor sake and most practical one is the relaxing seats to get yourself relaxed at weekends. 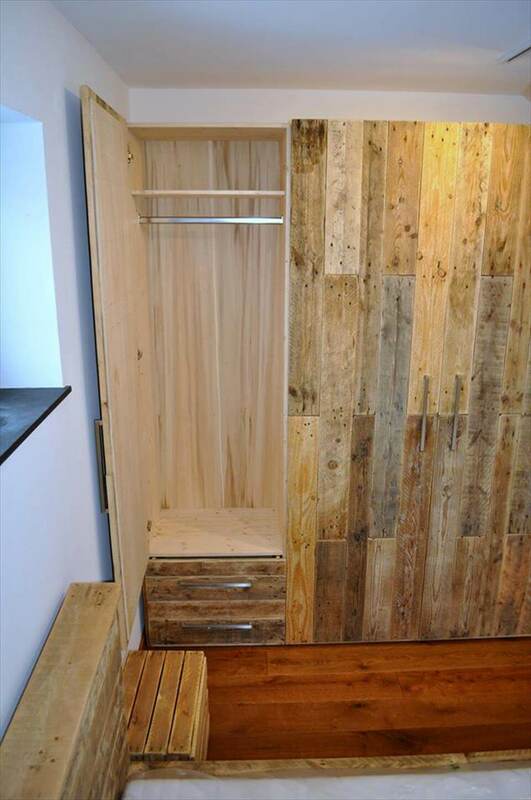 The indoor pallet ideas involve storage and organizing furniture pieces more and offer a verity of things for the storage of different items in different sections. Jewelry organizer for the ladies in their bedroom would be a perfect wall hanging. Then we have large and small chest of drawers made out of the pallet skid stacking to hold media stuff, decor items, and home utilities in hall, living or the entrance. Last but not the least we have a damn cute mini coffee table with drawer standing on wheels to be proud and super cute centerpiece of your living room. 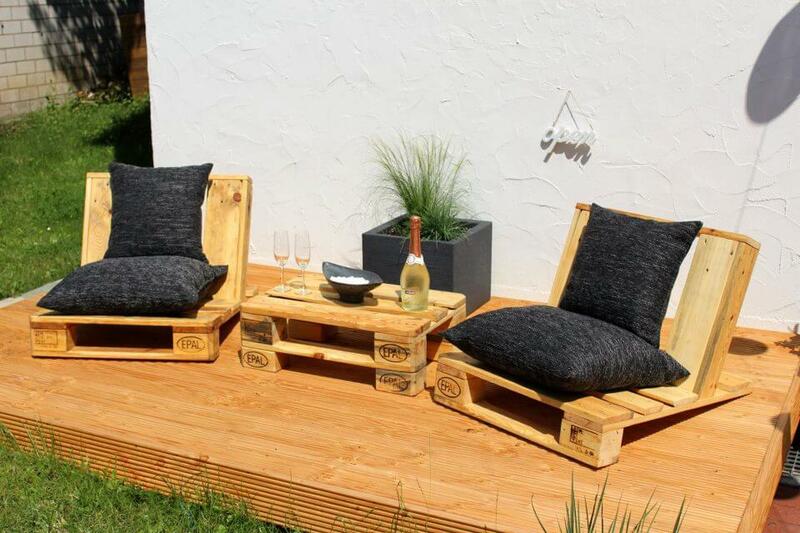 So wait no more and grab the pallets to make your house a perfect piece of land that you ever fantasized. 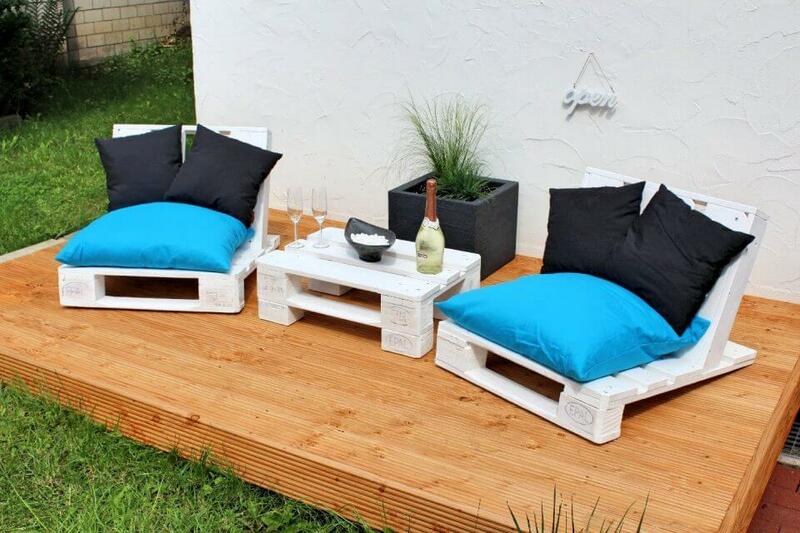 Grab some pallets to get this lovely and stylish breakfast table in your garden space and enjoy some fun family time together along with some tasty food. This set got a nice height table and two bench seats at side made with the pallet skid sections quite easily and looks so perfectly rustic being unstained. 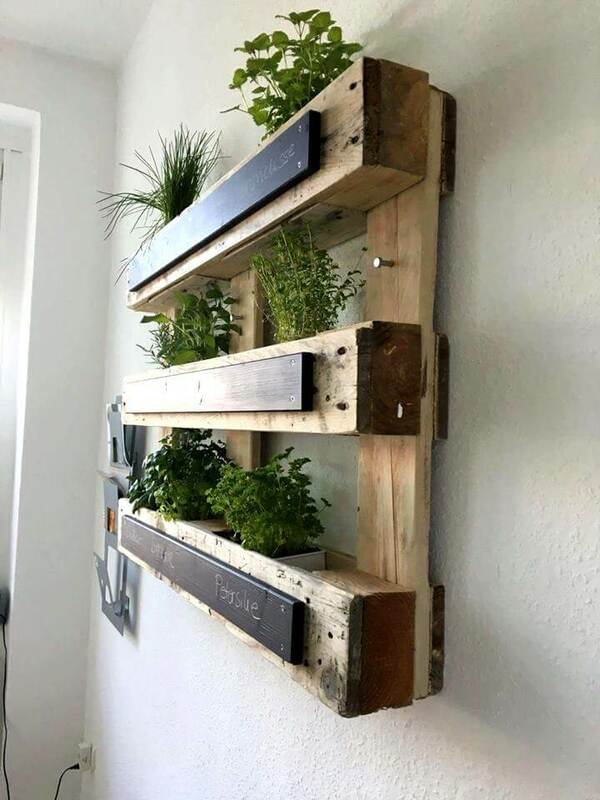 The Planter shown in the picture is made out of the pallet skids to hold your favorite plants, flowers or herbs and you can display this planter on the walls adding a refresh touch to the beauty of your indoor or outdoor walls. The vertical planter has three plant holding racks and more fun has been added to it by providing the racks the name plates with the plant name written on the them and thus letting each one know which plants are you growing in this pallet vertical planter. 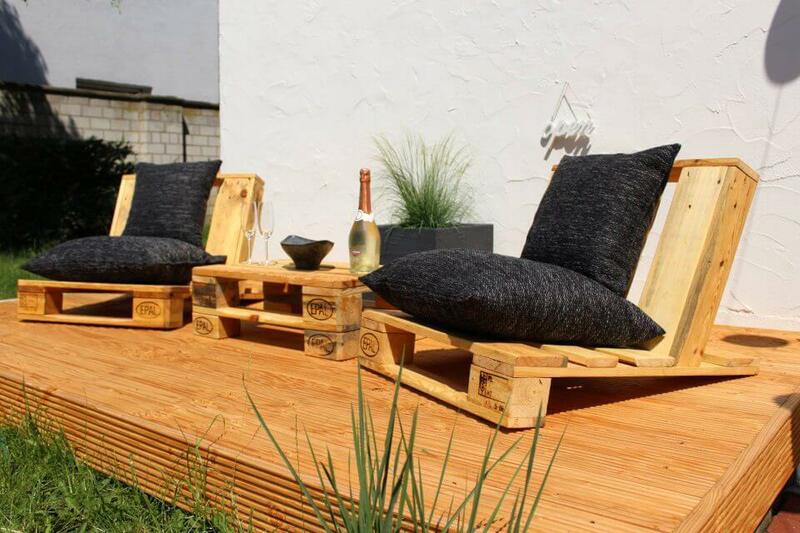 Outdoor section be it garden, patio or yard are the best places to spend your weekends at and getting yourself relaxes so use pallets to provide your outdoors this unique and stylish seating furniture and enjoy your holidays in the fun way. 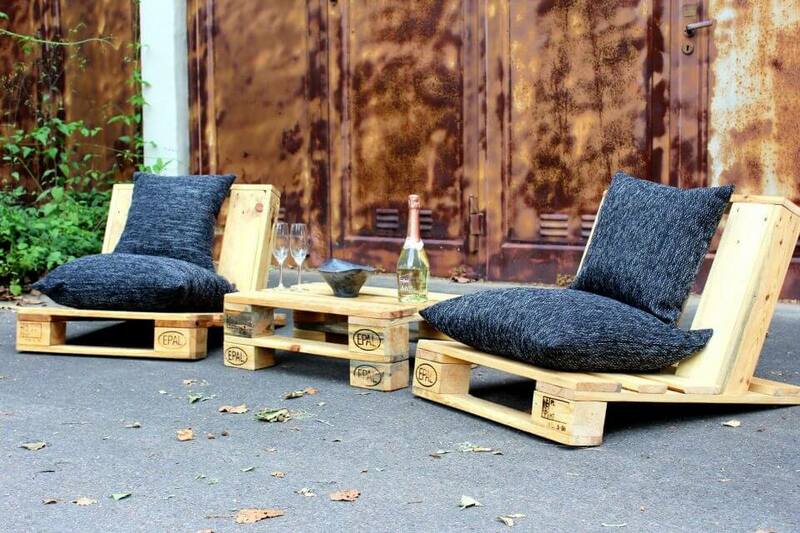 The seating set of the relaxing set got two lounger seats and a coffee table in the center made all from the pallets and is a perfect date point for the couples to spend some time with each other no matter if you are married too. 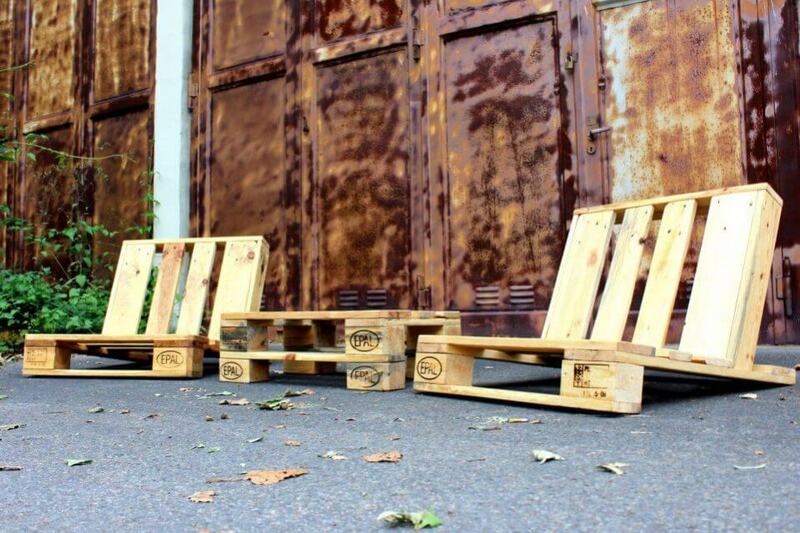 Using the pallet cut slats and the blocks both of these retro looking pieces of furniture have been created easily at home with the simple stacking method. You can keep this mini lounging set rustic with that unfinished woody look or make it stain in this dazzling white color to enjoy the modern and up to dated look of it with lovely cushions making it look more gorgeous and feeling more comfortable. 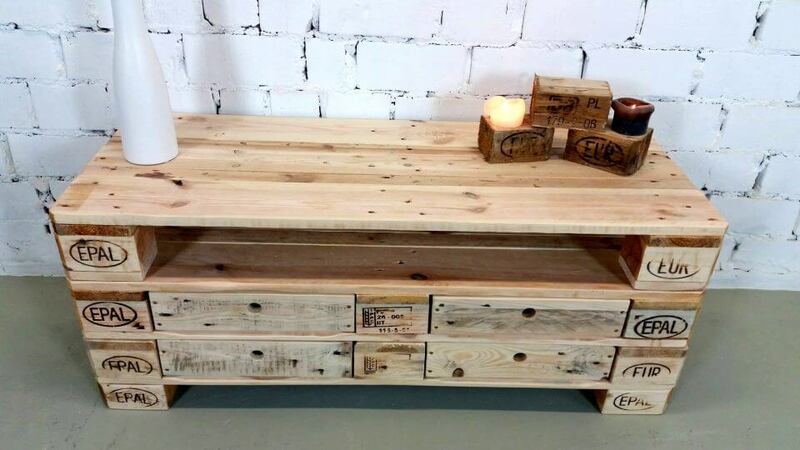 Layering the pallet double face skids on each other this lovely looking pallet tv console table has been very efficiently and nicely yielded. having a row of three storage pockets and three drawers for further storage options.Enjoy its rustic look or make it look matched with your home decor by getting it stained. This quite sleek and slim in design and large size pallet chest of drawers can be nicely built from the stacking of pallet single face skids on each other and giving rise to three drawers for the storage of some tiny knick knack stuff. You can use this flat in design chest of drawers as a media console table in your living or lounge room having a wide top to hold the big plasma screen and the eight drawers in it would let you hide a bunch of your small media utilites and other extra stuff and thus giving you tidy and clean spaces. You can layer up the skids over an over to get the desired height of your chest of drawers like shown in the above pictures. Hall Table, entrance storage or the bedroom organization this chest of drawer would satisfy all the problems.The drawer pockets can be filled with drawers or kept empty to use as shelves or to hold the storage baskets in them. 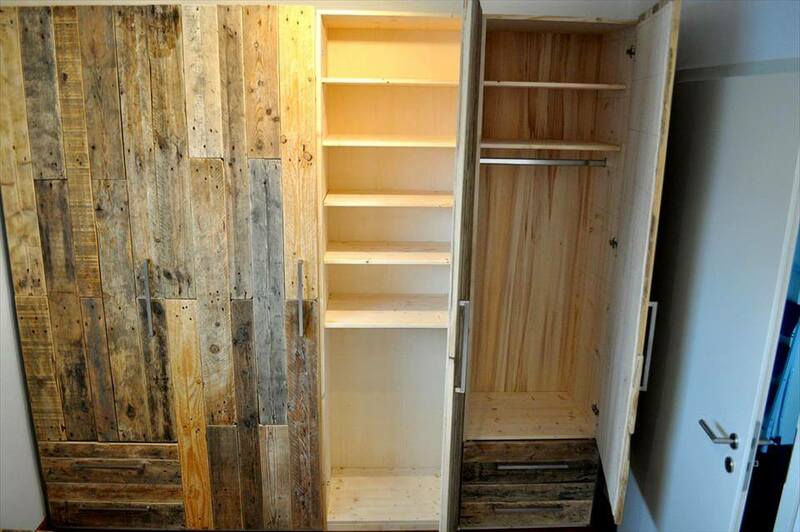 The above Five pictures shows a lovely wardrobe design made out of the pallets to adjust in your bedroom holding all your personal stuff. 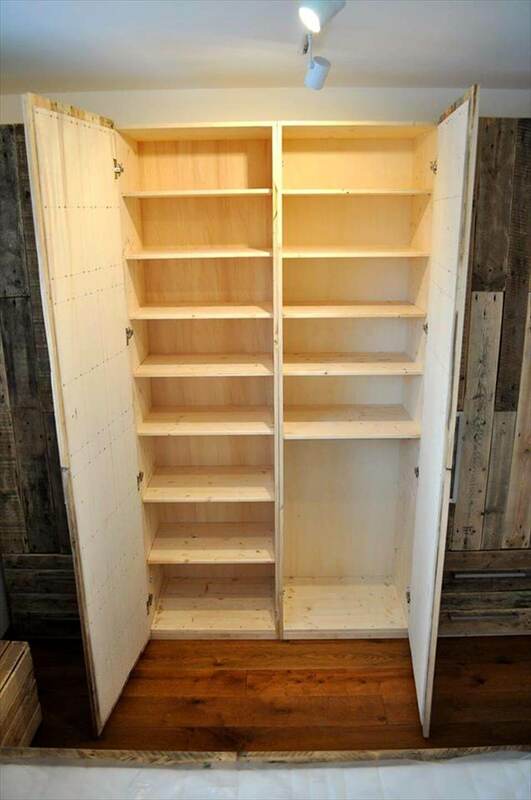 Especially a couple would love it more for having a lot of storage space and sections to organize and store their clothes, shoes, jewelry etc separately. 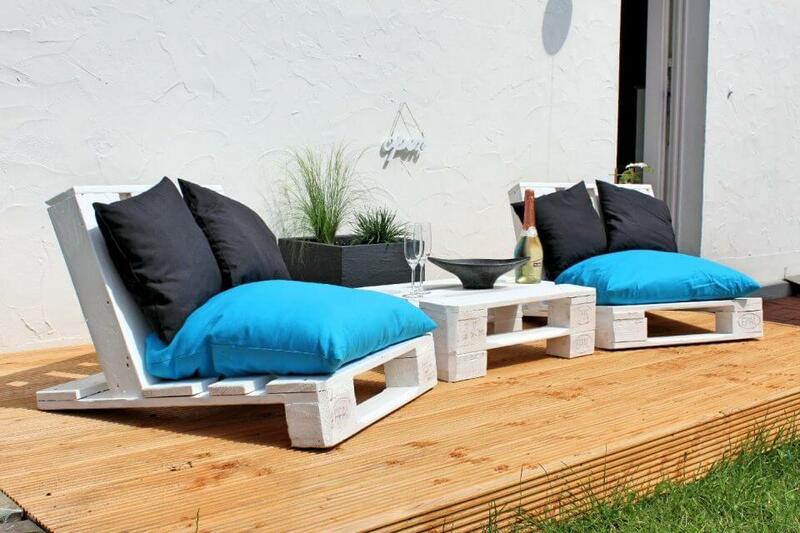 Pallet board forms the back section and sides while the front is made with tight packaging of the pallet slats and planks together. 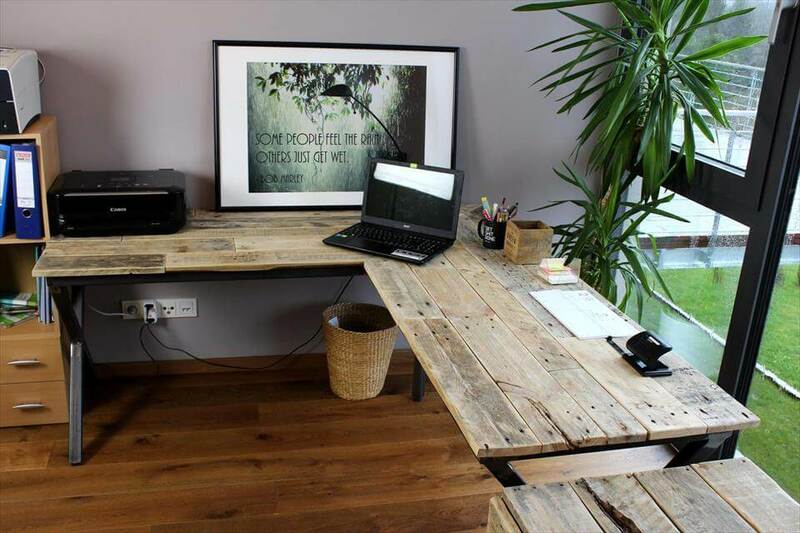 To shape up this incredible computer desk you need to have large pallet planks and some metal pieces. With the metal pieces the basic frame with X cross legs have been prepared and the pallet planks have been used to fill up the top with and making it complete. 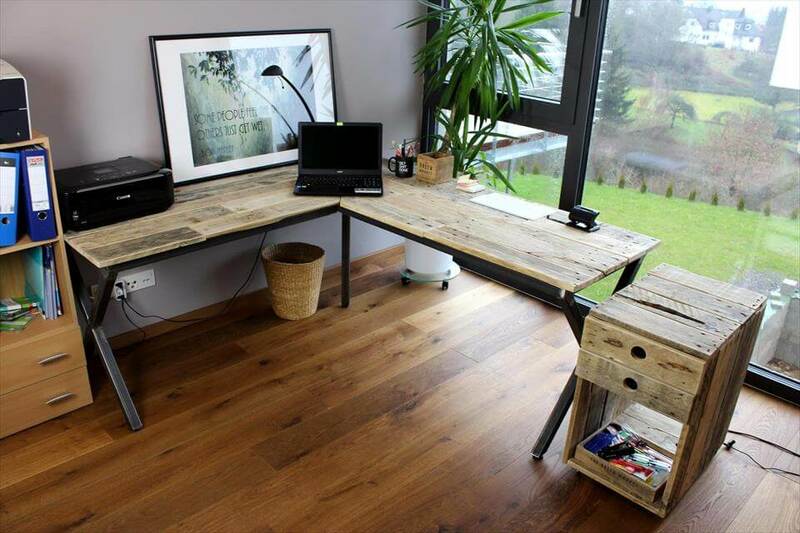 SO hurry to copy the idea and get your self a working station in your own house. 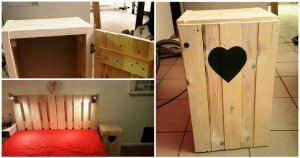 This absolutely cute and adorable coffee table design would make everybody to drool over its cuteness and charm.And the good news is you can make it yourself using some pallet cut slats and few block pieces in a square shape with a drawer in the center and wheels at the end. To the same mini coffee table design you can add one of layer of shelf made with slats and blocks and a new design would be created that would look like this. You can keep it like this or make it stand on wheels for a more stylish and modern touch Also stain it in some vibrant hues to look more up dated and modern.